If you are curious about how to simplify money, busyness or food, I’ve got some recommendations for you. How do I simplify my finances? A shift in how I thought about my finances dramatically simplified them. I used to always struggle to make ends meet and then as I cut expenses, got rid of credit cards and started to chip away at my debt, I realized that I didn’t need to make ends meet. I needed fewer ends. What can you cut? What can you live without (even if it’s temporary)? What are ways you can simplify your life and save money? Can you recommend a simple budgeting plan? I used Dave Ramsey’s The Total Money Makeover to get out of debt. I recommend a zero-based or sum-zero budgeting system where you spend every dollar on paper first. You might also enjoy this 21-day guide to help you become debt-free. I struggle with wanting to spend money on vacations since I know nothing is guaranteed in life. I don’t want to go into debt for them but I often do. We eventually pay it off but just in time to go on another vacation. I validate my feelings by telling myself experiences are important and that we’re making memories. Any advice? Once I became debt free, I started putting money aside for things in advance. I cut back on vacations while I was becoming debt free and for a while afterwards. You don’t need to spend a bunch of money to make memories. I agree that experiences are more important than stuff, but overspending and going into debt steals some of the joy from the trip and adds a bunch of stress to your life. It seems like you are keeping up with the debt by paying it off prior to the next trip. If that’s the case, skip a trip or two and save the money instead. Based on what you describe, you can easily break the debt cycle and start saving for your trips in advance. Less debt = more joy and less stress. I want to live slower and enjoy my life but I feel like if I don’t hurry up, then I won’t find time to do the things I want to do. What do you suggest? At some point you have to decide if you want to spend your life doing it all, and fitting everything in or if you want to notice what’s happening and enjoy the way you spend your time. When everything is important, nothing is. Make sure these things you want to do are important and meaningful to you, and not just things you want to check off a list. Since none of us are guaranteed time to do everything we want, we should at least enjoy the things we do. That requires not hurrying up, but slowing down so you have time to notice your life. I’m struggling to simplify my goals. I used to be so good at managing my time, accomplishing my goals, and balancing my commitments. Now I find myself extremely sleep-deprived, depressed, and struggling to find time during the day to get everything done. I don’t know what I should be prioritizing, and I don’t know how to say no. Please help! I’m only twenty; I don’t want to be this world-weary already. Prioritize your health first and foremost. Your mental and physical health come first. Otherwise, none of the other stuff is sustainable. Take a closer look at your goals. Are they goals you have for yourself, or goals you think other people have for you. Cross off any that aren’t yours. Once you are sleeping better and feeling well (goal #1), look at the other things you’d like to accomplish. Pick one. Only work on that for as long as it takes and as long as you are interested. When it’s done, choose another. They don’t all have to happen today. P.S. Here’s how to say no. Do you have tips on how to simplify daily household chores? Yes. Give them to someone else. I’m kidding, sort of. Involve family members in the household chores even if they don’t do them the way you would. Let being done be enough. It doesn’t have to be done perfectly. Another way to simplify daily household chores is to downsize. This doesn’t work for everyone, but cutting my living space in half, cut the cleaning in half too. You won’t be surprised to know I recommend owning less. 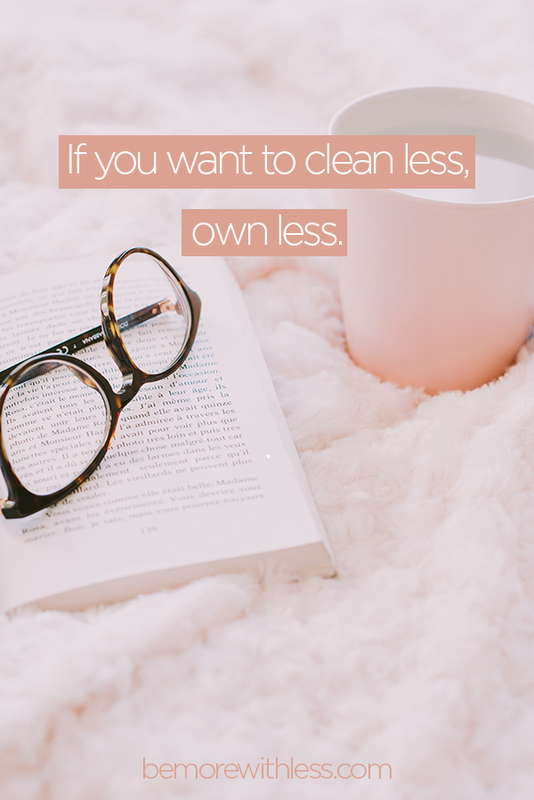 The less you own, the less there is to clean. I highly recommend the Fly Lady’s 11 commandments too. How do I simplify my day to carve out time for self-care? You have to make self-care the priority. If you are trying to fit it in when you have free time, it won’t happen on a consistent basis. Schedule it. Wake up to it. I recommend starting with the morning routine effect. How do I simplify a wedding, and wedding planning? For starters, simplifying the wedding will simplify the planning. Think about what’s most important to you (not to your friends or family). Chat with your spouse to be and have a meaningful conversation about the wedding day and the marriage. What kind of wedding celebration will support your values? Go from there. I often feel overwhelmed and stressed about preparing for the next work day and find it hard to wind down. What do you recommend for an evening routine? Start by understanding if the stress and overwhelm is coming from the inside or the outside. If it’s coming from the outside because you hate your job, or would rather be doing something else, here are seven things to consider. If it’s coming from the inside because you are naturally anxious, the best way to get this stuff off your mind, is to put it on paper. Write it all down before you try to go to sleep as a reminder to your mind that there’s nothing left to think about. After writing for a week, add something else that soothes you to your evening routine like reading, taking a bath or meditating. How can I simplify my daily to-do list? I never finish it. I quit daily to-do lists for the most part and focus instead on a weekly list. I used to overestimate how much I could get done in a day but it’s easier to be realistic if I focus on what I can accomplish over the course of a week. When you schedule a weeks worth of things, you can see at a glance if it’s too much and begin to pull back. Sometimes I want to get creative in the kitchen and spend time cooking and creating beautiful meals. Other times, I don’t want to think about food at all. If I’m working on a big project or don’t want to put extra time and attention towards food, I simplify by eating whole foods and mostly eating the same meals over and over again. For a more interesting approach, my friend Jules Clancy from The Stone Soup Blog is going to answer your questions on food simplicity below. How can I simplify my eating and cooking? It seems overwhelming to keep it simple! If it’s the nutrition side of things, my mantra is to follow author, Michael Pollan’s advice to “Eat food, mostly plants, not too much.” Focus on eating lots of veggies with some fish, meat, dairy, eggs and healthy fats. Avoiding processed food or anything in a packet or anything that contains sugar or flour is another great simple framework. If you want to simplify cooking, use recipes that are simple to begin with. How can I simplify my snacking habits? The easiest way to simplify snacking is to decide to stop eating between meals. If that’s not an option, I’d recommend choosing one or two of your favorite snacks and only keeping the ingredients you need for those snacks at any one time. You can always vary over the weeks and months if it gets boring. For me, I see snacks as fuel, rather than a source of pleasure (which I get from my other meals). So I have the same snack every day. I love Greek Yogurt with a tablespoon of linseeds (flax seeds) and a teaspoon or two of peanut butter. How can I simplify dinner? I’ve been focusing on whole foods and cooking lots of vegetables. Even if I meal plan and chop veggies ahead, I feel like it’s a lot of time cooking and cleaning. Is there a simpler way? That’s awesome you’ve been focusing on whole foods and cooking lots of vegetables! The way I keep my meals simple is to start with simple recipes. I limit the number of ingredients to six but you don’t need to be that extreme. I will have a big bowl of broccoli one night and then lots of cabbage the next. I try to get variety over the weeks and months rather than stressing myself out trying to prep and serve five different vegetables at every meal. If you’d like some simple recipes to help, get my free e-book of 5-Ingredient Dinners here. How can I simplify my pantry and still cook a variety of foods from around the world? Yes cooking from a variety of cuisines can add complexity to your pantry! I love cooking from around the world as well. To keep my pantry simple, I like to focus on a different cuisine each month and try to use up the ingredients that are unique to that cuisine before I move on to a different country. I also like to use substitutions wherever I can instead of buying another new ingredient. For example if I’m cooking Thai, I just use white sugar (or skip the sugar completely) instead of buying palm sugar. Sometimes this means the finished dish isn’t quite as authentic as it could be, but for me it’s worth it. The other thing I do is have a pantry spring clean from time to time. I look for ingredients that need using up and put them in a prominent position so I remember to find a way to use them. I struggle with meal planning. Can you help? Keeping meal planning simple is all about finding or creating a good system. If you’re happy to do it yourself, I recommend compiling a list of 10-20 of your go-to simple recipes. Then scheduling time each week to prepare your plan and shopping list. Just review your list and choose the ones you want to cook this week. Then compile your shopping list. The other option is to let someone else do the planning for you! There are plenty of meal planning services out there. I actually have a done-for-you meal planning service called Simple Meal Plans which focuses on recipes that use 6-ingredients. Learn more about it here. If you want to ask questions or share solutions, please comment below. Visit this article to see answers to questions about simplifying paper and photos and this one about simplifying your clutter, mind and clothes. SUCH great tips here. I’ve gone through simplifying our home and eating habits; now it’s time to tackle finances! My husband and I are also following Dave Ramsey’s approach and it already feels so freeing! One easy way to simplify dinner: frozen veggies. They’re often fresher than “fresh” produce since they were frozen before being hauled across the country in the back of a truck, they don’t go bad, and you can make exactly the amount you want for each meal.